This was a commission piece for a new customer. 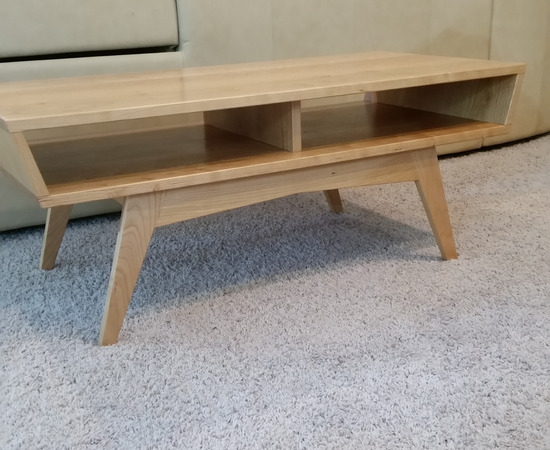 They wanted a modern table for a long narrow entryway. After sending them a couple of options, this is the one they ended up choosing. It's a pretty straightforward build. The leg-to -top joint has a floating tenon. As good as that joint is, there's going to be more leverage on that joint than I think it can handle, so I reinforced it with some 2" angle iron and lag bolts. With that, I'm confident there won't be any problems at that joint. 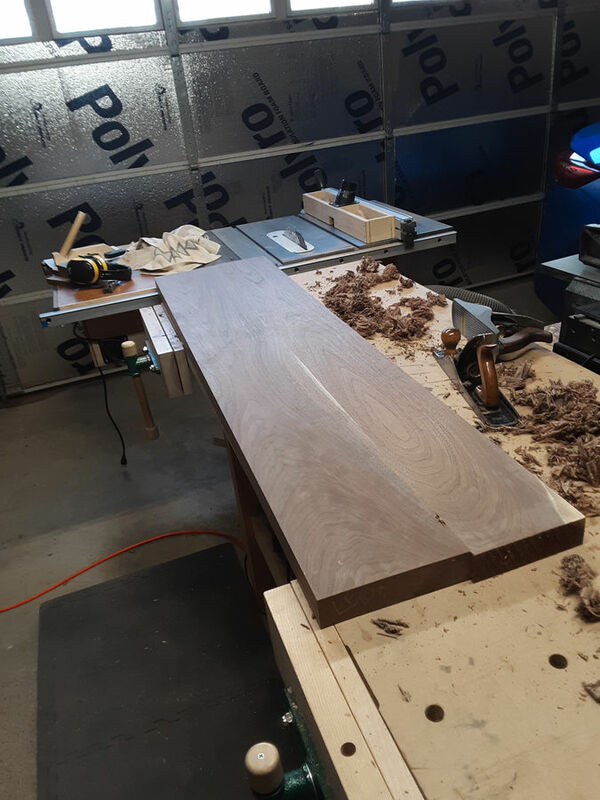 I started out with about 40 bdft of 8/4 walnut and about 10 bdft of 4/4. I usually use rough sawn lumber, so the first thing was to joint and plane down to thickness. 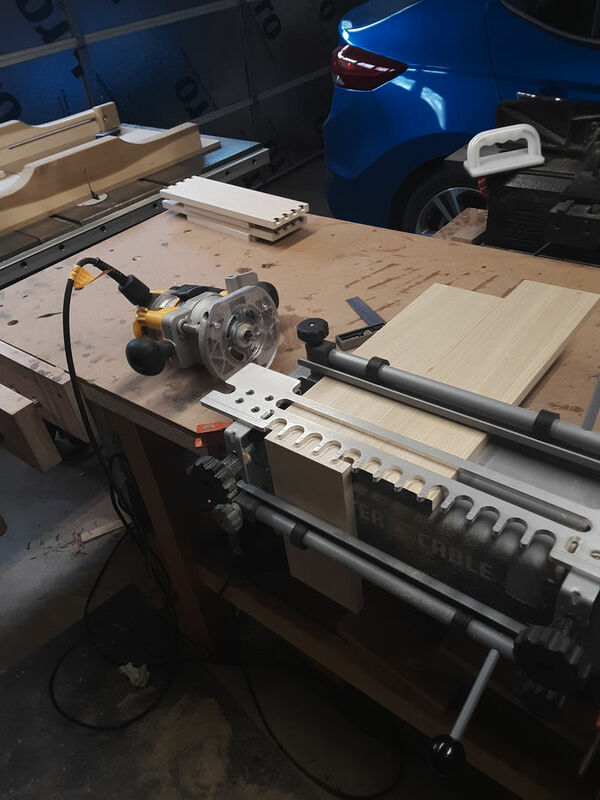 The boards were too big for my jointer, so I had to knock down a few high spots with a hand plane before they went into the planer. 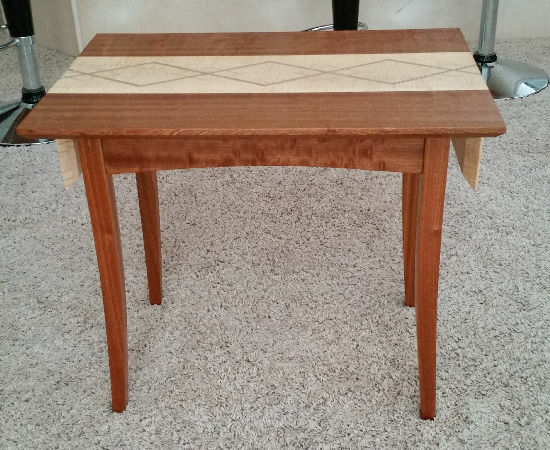 A hand plane and table saw gave me straight, square edges. With larger projects, like this, I like to have a plan. 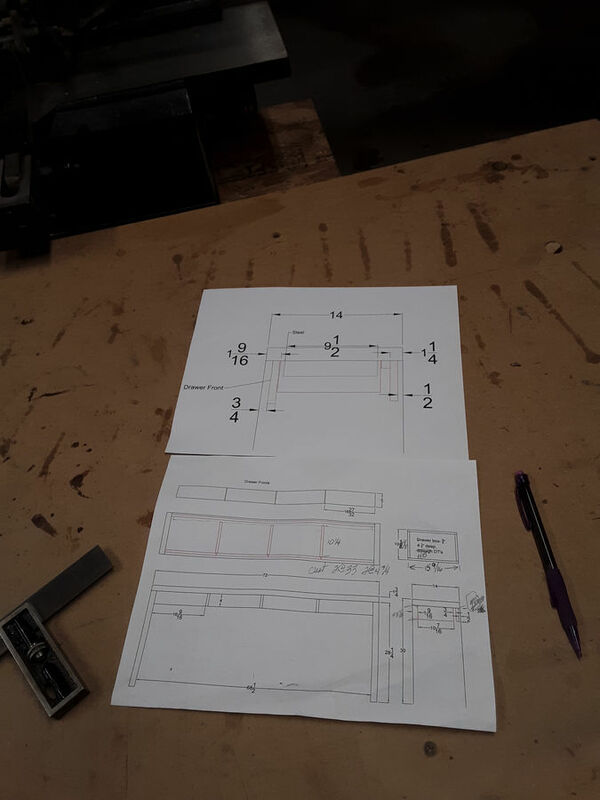 I used sketchup to have drawings for the client, but I drew up shop drawings in autocad. Whether you use a drawing program, or pencil and paper, I think it's helpful to have some things written down. This keeps me from making too much up as I go and causing a conflict later in the build. 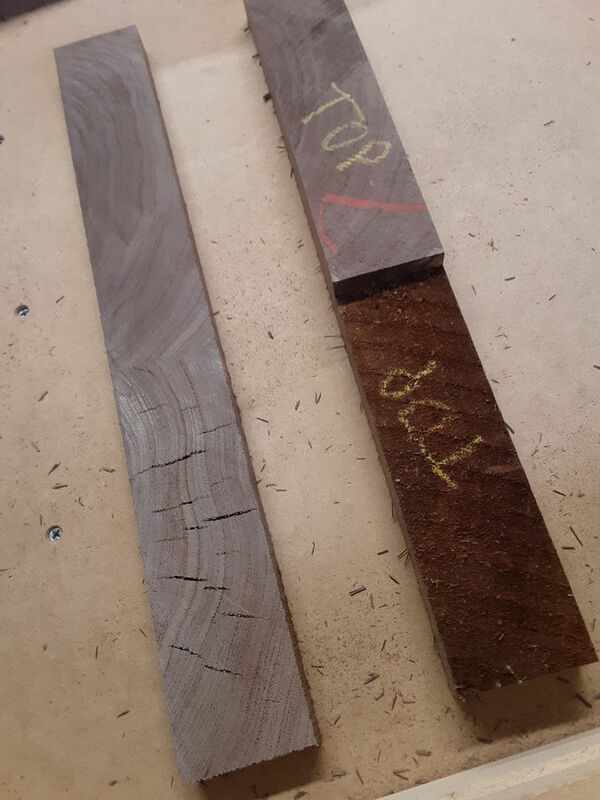 I always stay 3-4" away from the mill cut ends of the board. This picture shows why. The strip on the right shows the end. You can't see any cracks, but they're there once you cut that ragged end off. Those cracks went almost 2" into the end of the board. Glue only, no dowels or biscuits. A few cauls keep it lined up across the grain. Even with cauls, it still needs a little cleaning up with a hand plane. This is both legs combined. 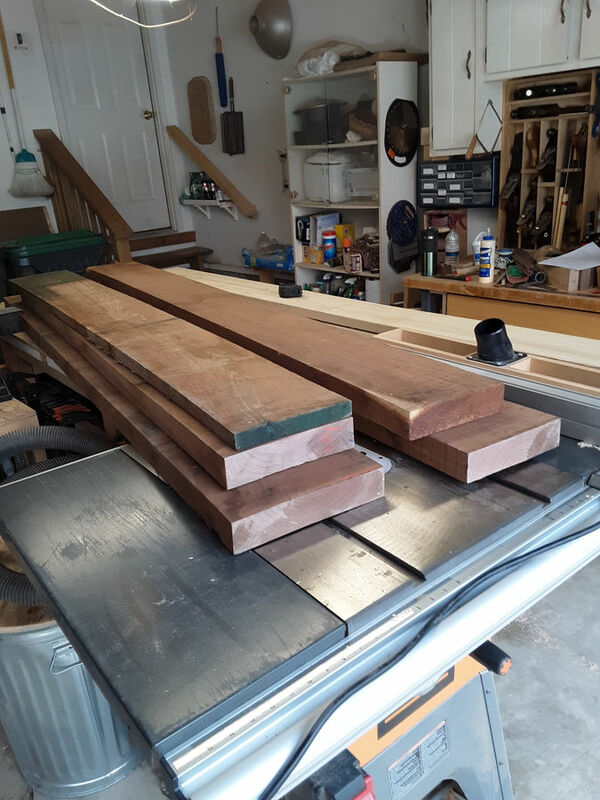 Next step is at the table saw. 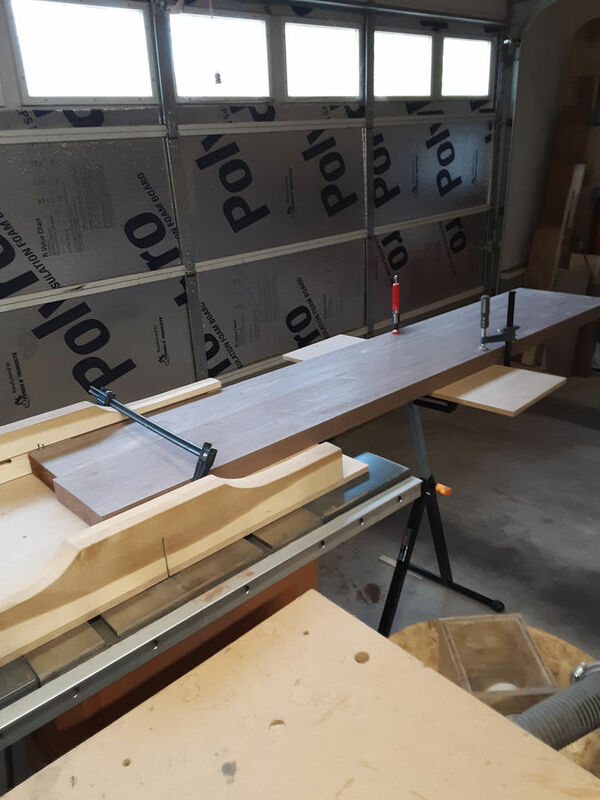 A roller stand helps hold the long end, so I can use the cross cut sled to cut everything to length. 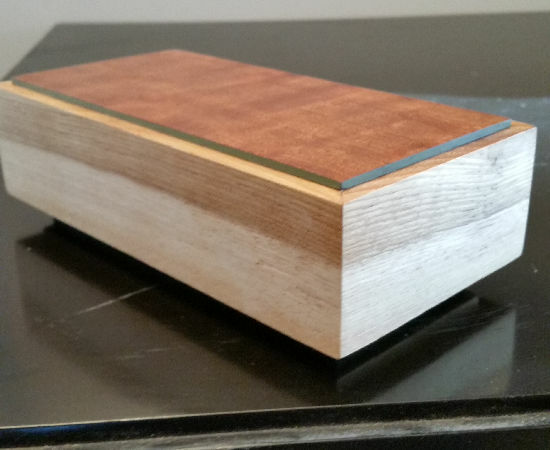 I milled some 6" wide white oak down to 1/2", then rounded one edge. 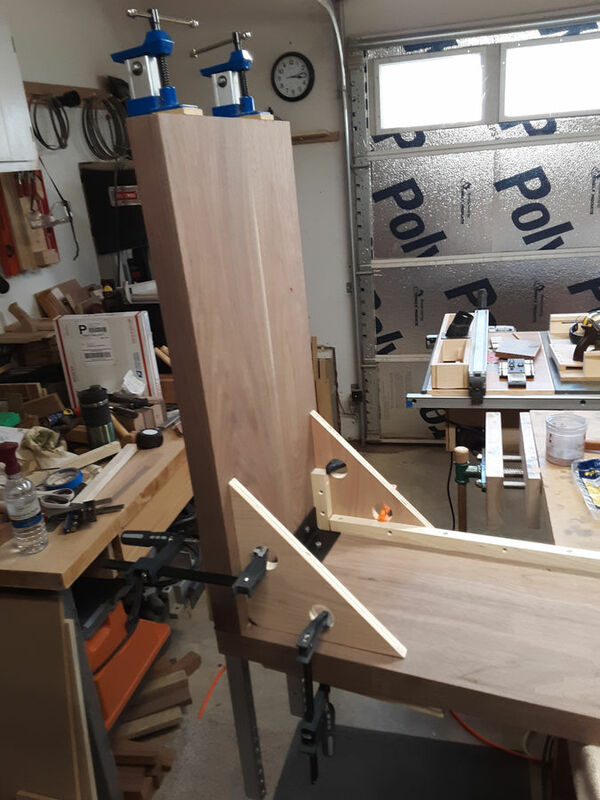 Two 1 1/2" slices will fit the 12" mortises on the legs and top. 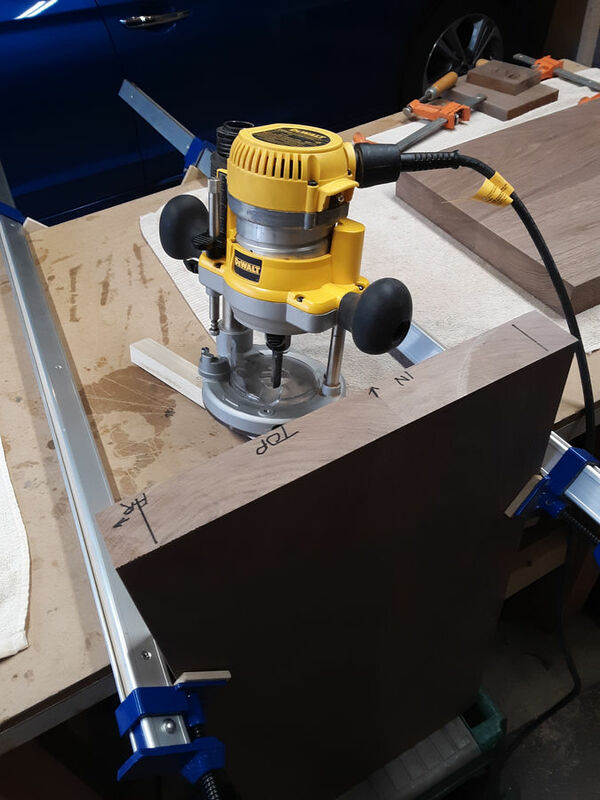 Right angle clamping guides help hold the legs square while the glue dries. You can also see the angle iron reinforcement. It's lagged into the top and each leg. You can also see the cleat that I used to attach the back (screw and glue), rather than a tongue and groove. 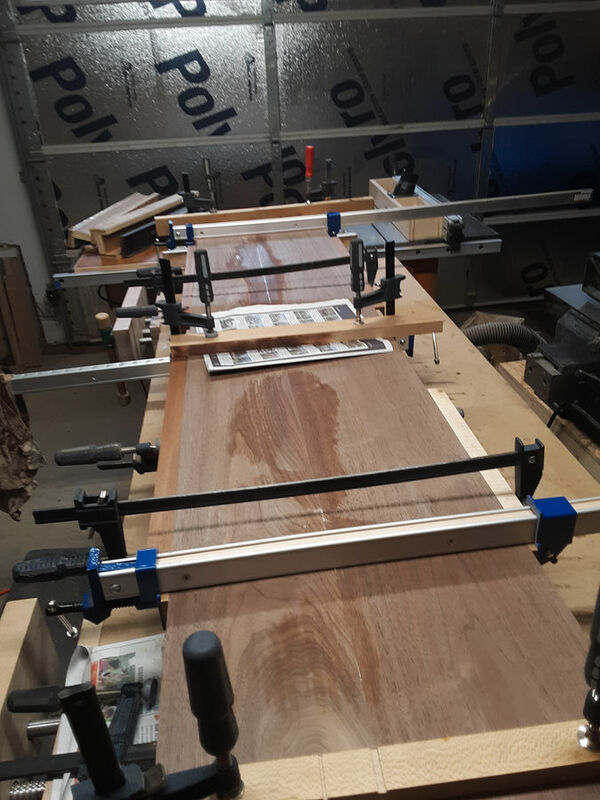 I thought about T & G, but I didn't think it would be any stronger, and it would make the glue-up much more difficult for one person to handle. I can make passable hand cut dove tails, but I'm very slow at doing it. 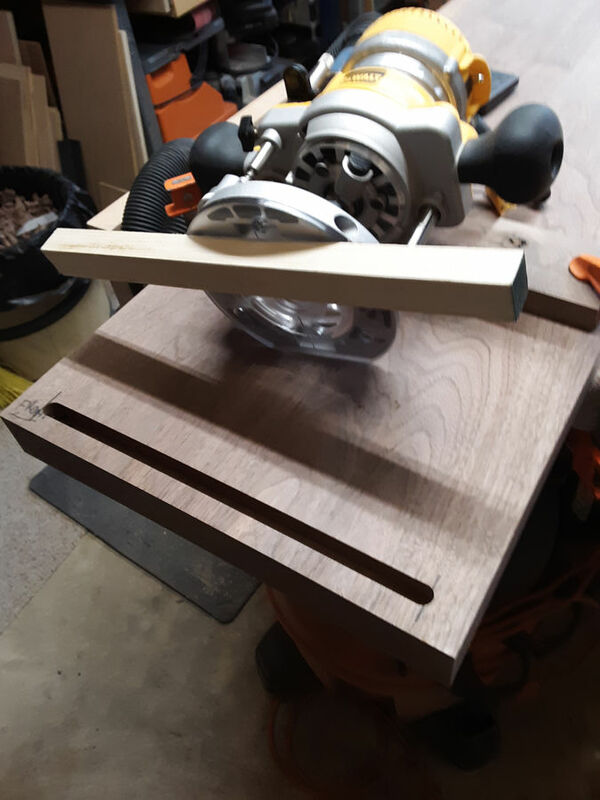 For basic drawers, I usually end up using a jig. It saves a lot of time, and cost for the client. 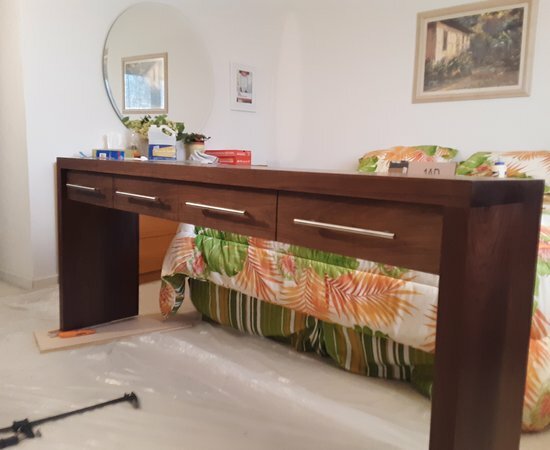 After the final bit of sanding, it's time for finish, then fitting the drawers. 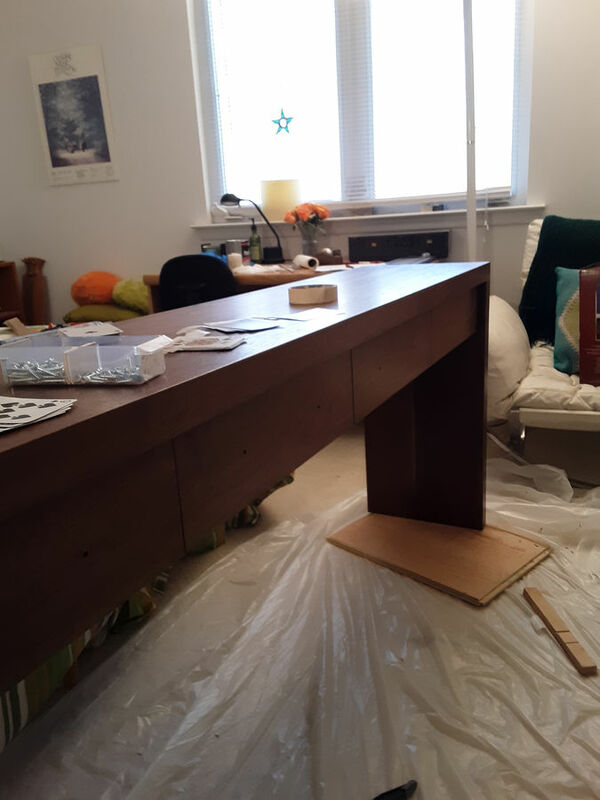 It's cold enough that finishing in the shop isn't feasible, so I move it to a spare bedroom, that I can close off. 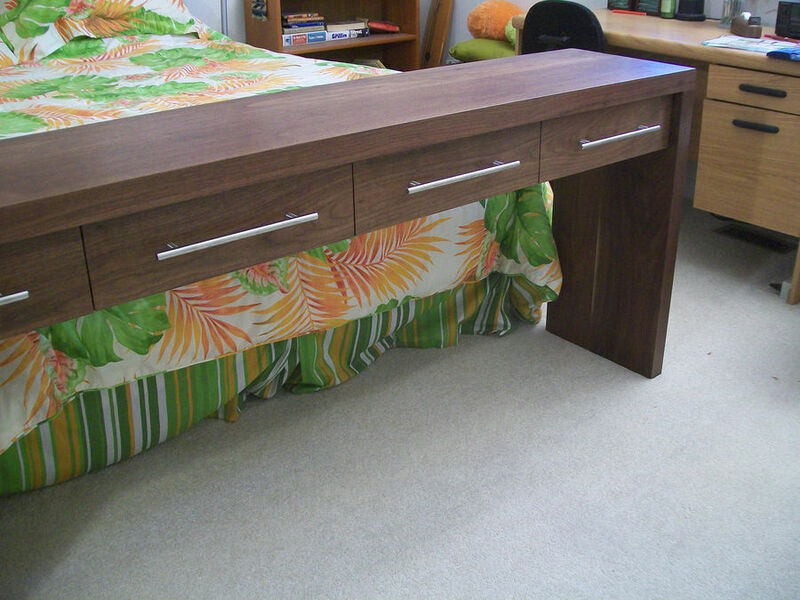 You can see playing cards being used for spacers for the drawer fronts. 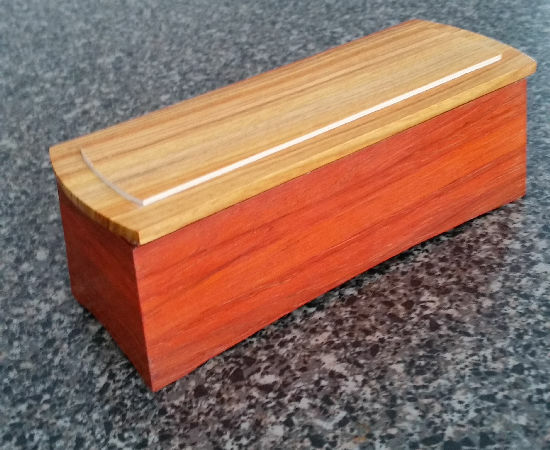 There are also dividers screwed and glued into the top, that the drawer glides are attached to. Here are a couple of finished pics. 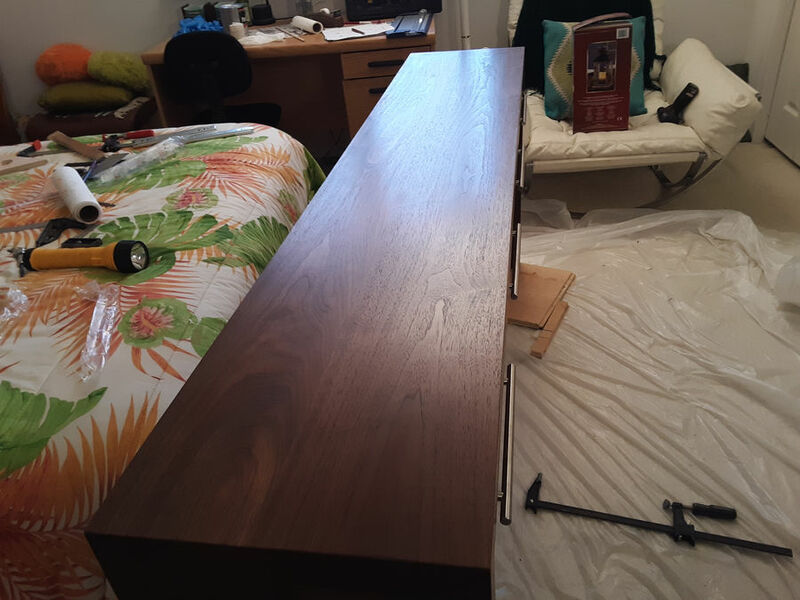 The finish was two coats of full strength gloss poly, followed by 2-3 coats of satin cut 50/50 with mineral spirits and wiped on. Thanks for looking. 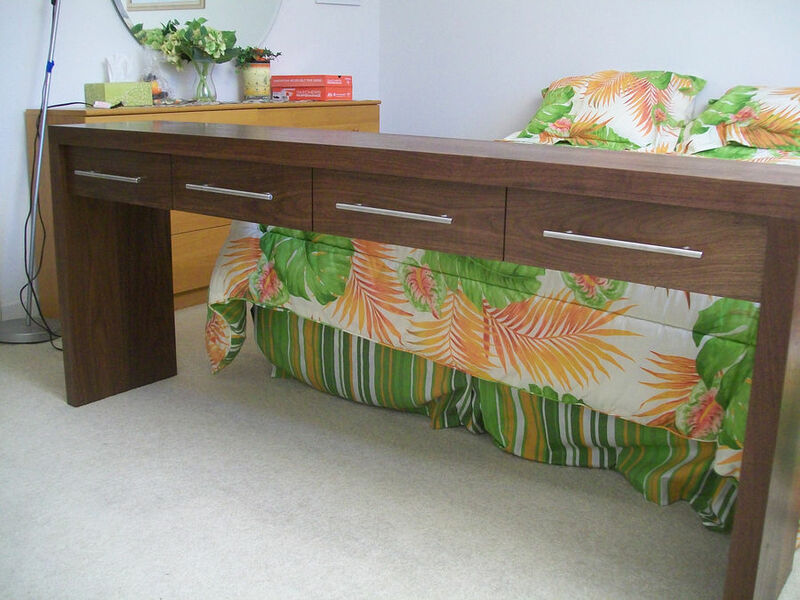 Great job grain-matching the drawer fronts. 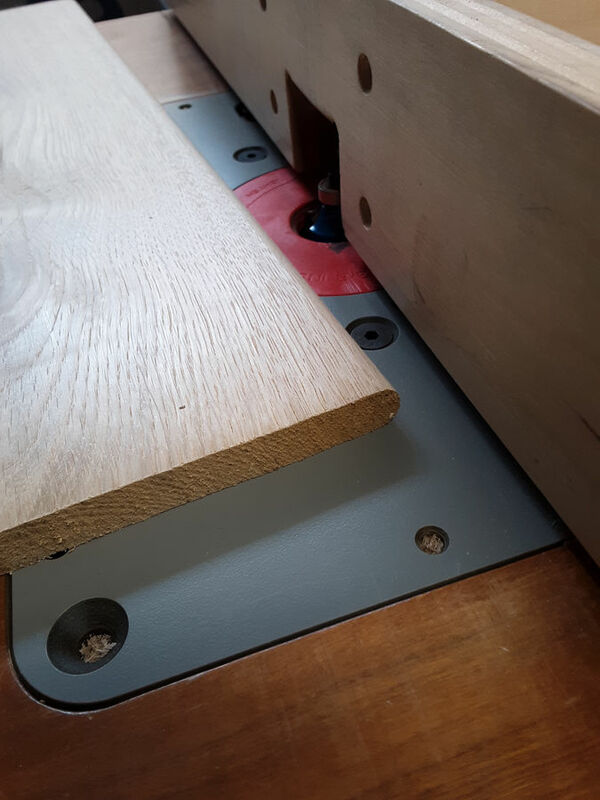 Looks like your gap between drawers is perfectly matched with the saw kerf. Did you use a thin kerf glue-line blade or just a regular crosscut blade? Thanks. 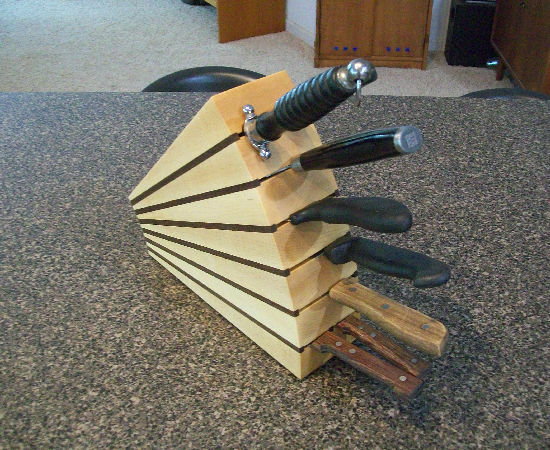 I used a full kerf combination blade. I used 1/16" gap for the drawer fronts.